I was told that homeschooling will not provide enough social interaction, which I later found was not true. Thus, I learned and was determined to make new ways and means from the same place where she was at her most fulfilled and happy self; her very own home. We arranged more family /friend gatherings and play dates at home. Moreover, some of her friends often joined her for few lessons weekly at our place. This gave her the joy of being with friends and having a learning environment at home. It is indeed true that good character is a foundation of many achievements. My priority was to enhance her character. She was inherently kind and gentle to every soul around her. What I focused on were the areas of her personality which would enable her to express herself without the fear of being judged while being her gentle self. I read aloud many fictions and non-fiction books which revolved around characters showcasing bravery and strength. In addition, we studied the stories and incidents from the life of our Prophet Muhammad PBUH and his companions. We spent more time on those narratives which depicted courage, kindness, initiation, and leadership. We made a Sunnah chart of 30 easy to practice Sunnahs and Ahadeeth. You can also call it a good habit chart. The purpose was to learn one sunnah or good trait each week and make sure to implement it. Smiling on the face of your brother, offering help to others without being asked, being a strong believer, visiting the sick, giving gifts and returning the Salaam (greeting) helped tremendously. She now knows that she should adopt these valuable traits not because she is told, but because there are wisdom, reward and far-reaching blessings in implementing them. Gradually, I began to observe her interests so I could teach different concepts in the context of those interests. For instance, she was ecstatic to learn recitation and Arabic with the dolls. Dolls…oh, how shall I tell you the delight of learning with them. They were students, manipulatives, and so much more for her imaginative play. Keeping her interests in mind made learning joyful for her. Just paying heed to her inclinations and interests gave me the idea to choose and dive deeper into those specific fields of interest. Interest-based learning made her feel fulfilled and gave her the assurance that she is indeed exceptional in certain skills or subjects. Every day, I could see her blossom like the tulips and primroses she used to encounter on our walks. In addition, nature study and walks gave her the blissful opportunity to embrace her true self. Being in nature and in the sun often was indeed healing. She would observe the majestic beauty around her and notice how each flower God has made is unique and beautiful in its own way and how they are all growing and fulfilling their purpose quietly. Later, I introduced her to the importance of working independently. Working and learning independently on a few things every day made her feel self-sufficient. I, too, was learning alongside her. While learning distinctive styles of teaching strategies, I learned what methods work best for us and the style which aligns smoothly with our lifestyle. Believe it or not, I even discovered new interests and different skills, unknown to me, that had been dormant within me for many years. 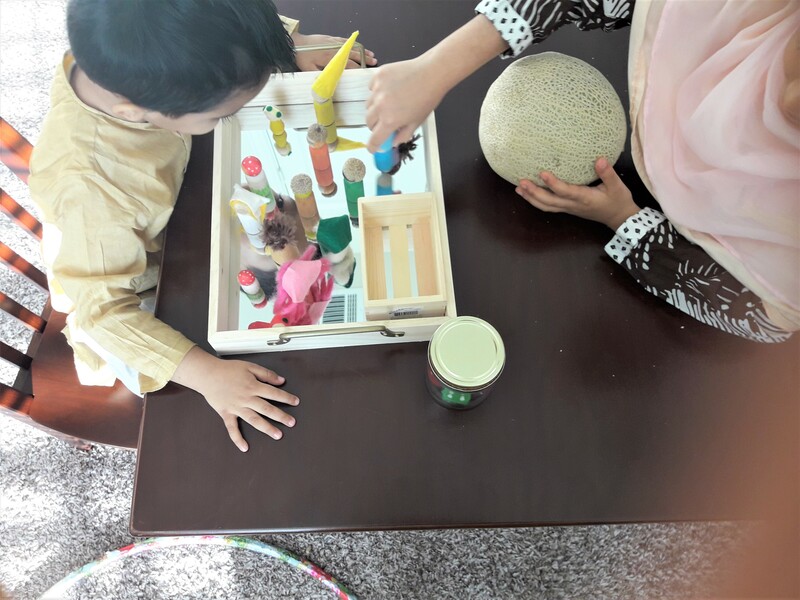 I exposed her to multiple activities and experiences such as swimming, robotics, nature walks, hands-on science experiments, recitation class, knitting, drawing, painting, martial arts, and Co-Op. We are very appreciative of the Co-Op we have in Dallas, Texas. It’s a beautiful place for my daughter, where some beautiful and hardworking mothers work as a team to give the best experience of education for our children. The co-op gave her the experience of learning in a social setting. As a result of which, she has formed meaningful friendships and relationships with adults and children. No, I couldn’t manage to do all of this myself. I was able to facilitate several activities for her to experience, which I could do with ease and peace in our homeschool environment. but I never hesitated to outsource. Different experiences and exposure gave her time to acquire her interests and strengths. Once we discovered some of her strengths, we decided to get better at them and participate in competitions held locally in our city. Being the center of attention and experiencing the pressure of being in the spotlight was hard. Initially, she would resist. However, by watching others lead, myself being her first model, her resistance gave way to inspiration. Along with time and gentle nudges she found the courage to face the stage. Words cannot describe the feeling of security and fulfillment I experienced when I saw my daughter facing the hall full of parents, children, and judges. My entire purpose of entering her in the competition was for her to participate and understand the know-how of tournaments. To my surprise, she was the first runner-up. I still remember the disbelief on her face and understood from where it came. There is a lot more I want to share but I believe for a first attempt, this would preface future communication. I invite you all to this beautiful journey of ours which is full of both ease and challenging work, victories and missteps, accomplishments and frustrations, and meltdowns and joys. Yes, all these experiences are a normal part of our children’s life. I encourage all parents to accept and appreciate their children’s unique personalities. Cherish them, give them time, space, and a sense of acceptance. This is one of the best gifts we can give to our children; enable them to fully discover themselves, while adding value to our society in their own fascinating way. I hope this will be beneficial to you. If you have any questions and suggestions, please share in the comments section below.